Our Square Trim brushes are manufactured with a high concentration and uniform wire fill, resulting in stiffer construction equal to bench mounted wheels, eliminating the need for reverse shanks. Available in carbon steel in various diameters and sizes, the brushes are made with ¼" shank for easy installation on portable or stationary tools. The maximum suggested RPM is 4,500. 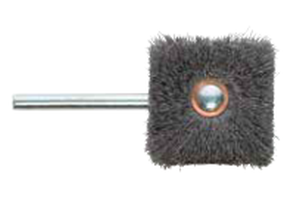 Square Trim brushes are ideal for cleaning internal areas especially removing fine burrs from cross-drilled holes. They are also used to clean and polish corners and irregular shaped surfaces.